Delta #EpicFail —Epic Fraud #3 : Security Sharing and not Caring….. who’s got that Constricting Feeling ? Thu, 30 Jun 2016 at 9:23 p.m.
Tue, 28 Jun 2016 at 10:33 p.m. Readers, in recent posts we have kicked the tyres of the Delta assets, put it up on the what-if hoist and peered into the grimy underside of the business. Unlike the Delta’s hired hands Murray & Co, we have considered the running costs. Our conclusion was that Delta was a very tired machine, running badly, with an overpaid driver at the wheel. It failed all the financial leakdown tests and was going to be an early entrant to the knackers yard because it was pulling a grossly oversized semi-trailer of debt. There, that’s all of the earthmoving metaphors needed for the evening…. However readers, in addition to all the other bad news we have received as owners of Delta, there is one further thing not considered by Murray & Co in their ask-no-questions, see-no-problems report that will further decimate its value. That is the likely cost to Delta of the impending court case that alleges Delta is a party to constructive fraud. The High Court was advised on 13 June 2016 that Delta and Gold Band Finance are to be joined to the existing proceeding against Noble Investments Ltd. Readers, after tee-ing up the obligatory Choysa – just one cup tonight, thanks – may wish to refer back to the Epic Fraud posts to refresh their memory about the story so far. 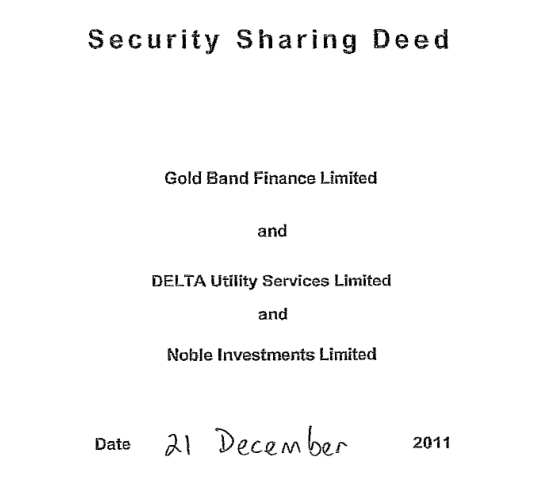 In the first post it was explained how DCC claimed that there was no “relationship” with Gold Band, but in fact Delta had prepared a Security Sharing Agreement which Gold Band signed, which was a dictatorship, where Gold Band could not act in relation to the first mortgage in any way, without Delta’s permission. Delta is 70% owner and 100% controller of that mortgage. While Delta is not yet named in the Court action, Delta is hiding behind the name of their security sharing partner Gold Band. That is, Gold Band’s name is on the court papers with the authority and instruction of Delta who is controlling Gold Band. In the second Epic Fraud post (What Would Tom Kain Do ?) it was noted that Delta’s law firm had received a letter alleging Delta was a party to constructive fraud. What if? did not publish this post until recently as it was concerned that Council would somehow deem this defamatory or some other breach of arcane local body law. (Council has plenty of resources to seek to stifle legitimate debate, but none it seems, to clean the filters in the Portobello Rd stormwater pumping station). As Cr Vandervis says, Council should stick to its core tasks. Your correspondent, in the name of duty, re-opened the arid pages of the security sharing agreement that is pivotal to Delta’s public assurances that all is well and its “investment” of $1.2M over the face value of the debt to acquire, is prudent and sensible (?). Expecting only to find parched prose, and arcane legal minutiae, yet again, there was a blooming oasis of sustenance for more posts. Tonight we shall hold some clauses of this deed up for scrutiny, allowing it to twist and flap forlornly in the breeze, just like the broken street signs at the desolate and unfinished Noble Subdivision. Clause 2.4 d) of the security sharing document has the remarkable sentence : where Delta instructs Gold Band that it “May refrain from doing anything that would be contrary to the law”. In any document this correspondent has ever worked with, obeying the laws of the land is not optional. Most legal and contractual documents have words to the effect that nothing in the document shall be contrary to the laws and acts current at the time. So a) this statement was entirely unnecessary…. if the law of the land was intended to be followed. But b) if some ultra vires legal deception was intended, then some “clarification” was needed. “May refrain” is not a ringing endorsement of a party’s intention to stay on the right side of the thin blue line. And when the instruction is in response to a long and detailed list of obligations imposed by Delta on Gold Band, it is hard to shake the notion that Delta did contemplate that some illegal activities were possible or even probable to recover some of its wasted millions. So it instructed Gold Band that they “may refrain” from any Delta instruction that may not be legal and proper, in place of the usual expectation to act lawfully…. at all times. Delta’s priority was what was “enforceable” under the document; Delta of course not being overly concerned with proper form or legal niceties such as performing major subdivision work without a consent. But while a nod is as good as a wink to a sharp commercial operator like Gold Band, Delta are literal in outlook, and so, two clauses later, is the payback for Gold Band agreeing to “may refrain” from illegal activities, instead of acting lawfully at all times. 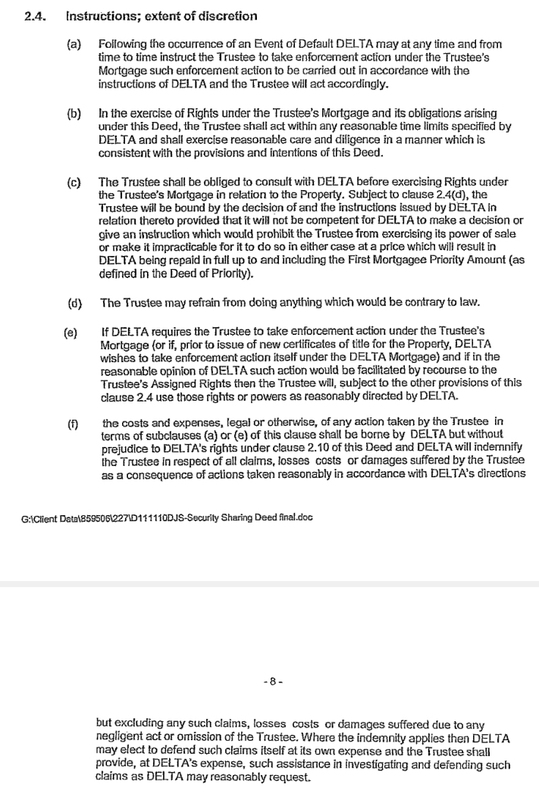 At Section 2.4 f) in return for Gold Band doing precisely what Delta bids in terms of protecting its first mortgage interest, Delta promises Gold Band “Delta will pay all costs and expenses, “legal or otherwise” of any action taken by the trustee”. Now Delta’s lawyers will rush in and say, CD is a buffoon – and a barely literate one at that !! He doesn’t have basic comprehension SKILLS ! “Legal or otherwise” is referring to the “costs and expenses” not the following words that say “of any action taken by the trustee”. Readers, that may be so, but the words legal or otherwise in relation to costs and expenses are redundant. The phrase all costs and expenses means precisely that – all of them. On the other hand, a learned Judge, having already knitted their brows over the words “may refrain from illegal acts”, when they see the tangled syntax of 2.4 f), in regard to “payment of all costs and expenses, legal or otherwise, of any action taken by the trustee” will look at the context, and will very likely conclude that Delta are at least contemplating illegal acts and then are reassuring Gold Band that they will still pay for the costs and expenses of those same illegal actions. Yes, yes, readers, I hear you – CD is being sensationalist – grasping at straws ! Trying to stay relevant ! Delta would be completely stupid to try and document illegal activities !! Sadly, readers, hubris is contagious, and Delta have a history on this project of operating on Delta terms, and the law be damned. However, there is another reason and that is, if Delta did instruct Gold Band to act illegally, and the question of payment was not sorted out, Delta could pull another static clothesline tactic out of the Tom Kain archives and refuse to pay Gold Band. Delta would say, à la Kain, Gold Band should have known, as a finance company experienced in mortgage lending, that what Delta were asking was illegal…. and they did this at their own risk and cost ! Take that, and your spurious cost claims with you, Gold Band ! ….What a tangled web of suspicion and mistrust the Noble Subdivision has left !! The bottom line : While Delta deny they influence Gold Band in any way, these clauses stipulate that Delta will fund Gold Band’s legal costs incurred in the attempts to defeat the landowners’ prior lawful caveats and interest in the land. And let us not forget that Gold Band wanted to sell their first mortgage interest to the landowners, and Delta refused to allow it. They had that power under the deed – a dictatorship, remember, readers ? Your correspondent says that this sort of cynical desperation moves Delta from the merely dense category to the despicable. Readers, citizens, this talk of illegal acts is not conjecture. In upcoming posts, we shall count the ways in which Delta is alleged to have not acted lawfully. Delta’s potential joinder to constructive fraud is just the start. If the allegations of these further acts are upheld, the consequences for Delta, and various high level DCHL and DCC personnel are just too awful to contemplate…. for the moment. But tonight, spare a thought for the lawyer(s) who prepared this security sharing deed. It was undoubtedly never intended to see the light of day, much less be forensically examined and trashed in the good pages of What if? There must be a sense of dread and unease in the weeks to come. Your correspondent says this imprecise and unenforceable deed is going to be systematically destroyed. Someone, we dare not name, will have indeed, That Constricting Feeling…. We thought ourselves brilliant and grand! With brass neck, like our plated Gold Band. 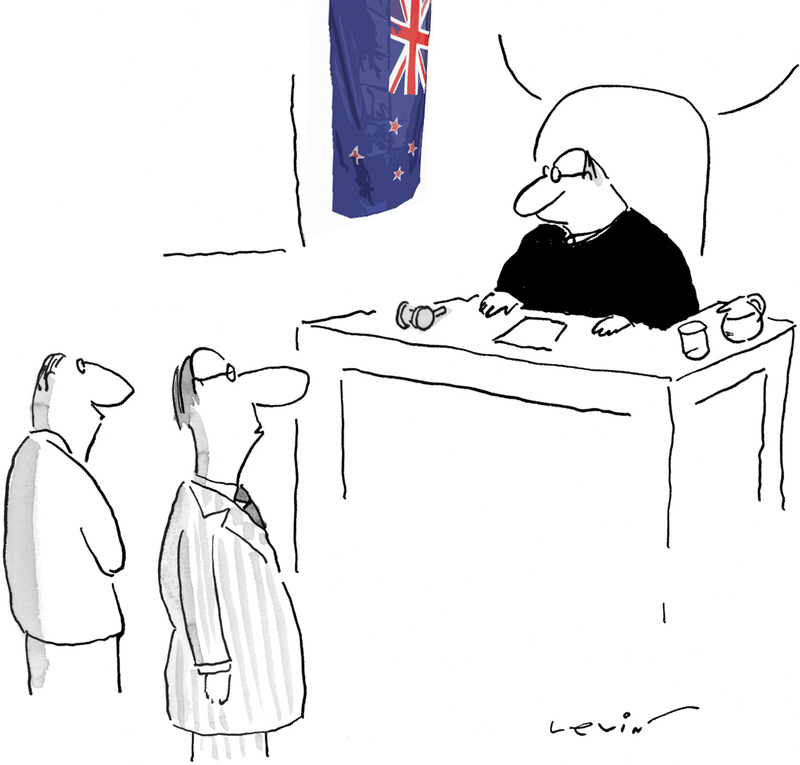 That would be funny if it were exaggeration for effect, pity it’s nowt but unvarnished truth. That cracked me up, don’t know why since it’s so consistent: May make roadways any way that takes your fancy at the time or as specified in the district plan, your call, toss a coin, don’t sweat the small stuff and so on. May refrain is what you tell the chaps with fierce tattoos who do repossessions and debt collection on a strictly cash basis, well, it’s what you tell them if the do-gooder who recommended them hadn’t said they were reformed characters who’d left their old ways behind them. Always enlightening, and always entertaining CD! The ODT has failed miserably in investigating this seemingly substantial failing by Delta, its management, directors and DCC (as shareholders) senior staff, Mayor and Councillors, who all turn a blind eye to the ramifications which could be horrendous for the citizens. As the peoples’ voice, the silence from that newspaper is deafening. Is it because it supports the system over the people’s interests, or is it simply that there is not the skill within to be able to ‘see the wood for the trees’? ‘The People’s Voice’ is a Canadian English newspaper for International Labour, or the Israeli Palestinian Peace Initiative. Does Sir Julian know of these associations? Tom Kain: Canterbury’s Tom Paine, based on a song by Bob Dylan.